The Royal Court of Affairs in Muscat, Oman is the home of Oman’s cabinet and is therefore an important building in the framework of Oman’s governing system. It is a place where ministers can discuss both national and international affairs in a relaxed and secure environment. It was decided to create a new Court of Affairs building to give ministers and dignitaries improved facilities and create an internationally recognised structure for Oman’s Government. As part of the building’s design a large decking area was needed to complement to the pool area. It was important that the decking was proven to withstand both the extreme hot and cold temperatures which are a feature of the region as well as being suitable for pools. We had been involved in projects in the GCC region before through Timber Tech LLC and we supported them fully throughout the tendering process for the Royal Court of Affairs Decking. Our composite decking is a modern and hardwearing alternative to traditional decking and is an excellent choice for situations where decking is wanted but traditional decking cannot be used. As our composite decking had been used successfully in the region before our partners were able to secure the contract in Muscat and we shipped the decking and other building materials direct from our warehouse in Hertfordshire. Our solid redwood composite decking was chosen as it fitted in with the ‘oasis style’ of the design of the pool and clubhouse area. We worked closely with our client Timber Tech LLC to make sure that the decking was supplied in time and to coordinate with the building construction schedule as a whole. As we have the experience of global logistics and dealing with international clients the decking and associated materials were delivered on schedule. We liaised with our customer throughout the project delivery and installation to ensure that the project ran smoothly and synchronized with the rest of the build. We are very pleased that the project ran to schedule and we are very pleased with the new look of the Royal Court of Affairs. 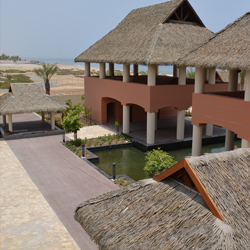 Timber Tech LLC is a subsidiary of Proscape, one of the premier landscaping contractors in the UAE. Working on internationally recognised projects such as the Dubai Marina and the Burj Khalifa Tower complex in Dubai Proscape has established itself as a leader in quality commercial installation throughout the region. Copyright © TimcoWood Trading All Rights Reserved.